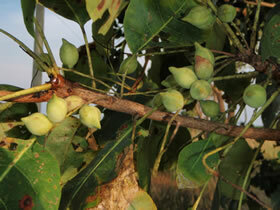 Kakadu plum (also called the Gubinge, Billygoat Plum or Murunga) is a small deciduous tree found growing wild extensively through out the subtropical woodlands of the Northern Territory and Western Australia. It bears abundant crop of small plum-like fruits. The fruit has a very high content of vitamin C, in fact holds the World Record. It’s full of antioxidants, folic acid and iron.